I'm no expert at ADFS and/or Certificates.... so feel free to correct me at various places. You can use self signed certs for Token signing, however at startup i had to use the same SSL for all. I started off with a self signed SSL cert to test my setup. then replaced it with 3rd party. Would recommend checking out SQL database options before installation, to plan. I didn't have a need for SQL database as oppose to WID. · When you launch the install program, click Next. · Accept the license and click Next. · On the Server Role screen, choose Federation Server and click Next. · The wizard will automatically install the required prerequisites. Click Next to begin the installation. · Install the Godaddy certificate for adfs.fabrikam.com to local computer account. · On IIS make sure the default Website has a 443 binding and set to use the adfs.fabrikam.com certificate. Now that we have the certificate installed, we can start the AD FS configuration. To launch the AD FS configuration wizard, just go into Administrative Tools and click on AD FS 2.0 Management. 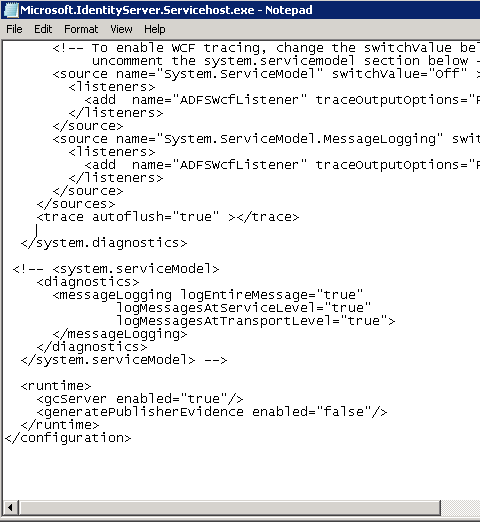 · When the AD FS Management Console opens, click the AD FS 2.0 Federation Server Configuration Wizard Link. · On the next screen select New federation server farm. On the Federation Service name, choose the adfs.fabrikam.com certificate to use. You must then specify a Service Account in Active Directory that will be used by AD FS. On the Summary Screen review the changes that will be made and click next to begin the configuration. · Install ADFS 2.0 using the setup file. 1. Open the Certificate MMC console. · Log on to the original ADFS server which contains the service communications certificate with the private key. · Open the Start Menu and type “MMC” in the search box and press enter. · When the console opens click “File” and select “Add/Remove Snapin”. · Select “Certificates” from available snap ins and click the “Add” button to move to the “Selected Snapins” window and click “OK”. · When the “Certificate Snap-in” windows appears, select the “Computer Account” radio button and click “Next”. · On the “Select Computer” window, select the “Local Computer” radio button. · You will now see that it has been added to the selected snap-ins. Click “OK”. 2. Now that you have the local certificate MMC open you can start to Export the cert. · Expand “Certificates (Local Computer)” then expand “Personal” and highlight “Certificates”. · Right click the certificate to be exported (in my case adfs.pipe2text.com), select “All Tasks” then “Export” from the menu. · Click “Next” on the “Welcome to the Certificate Export Wizard” screen. · On the “Export Private Key” screen Select “Yes, Export Private Key” and click “Next”. · On the “Export File Format” screen Select the “Personal Information Exchange = PKCS #12 (.PFX)” radio button and Check off “Include all certificates in the certification path if possible” and “Export all extended properties”. Make sure “Delete the private key if export is successful” is deselected. Click “Next”. · On the “Password” screen, enter a password and make note of it (This is the password you will use when importing the cert to the new server). · On the “File to Export” enter a name and location for the file and click “Next”. · On the “Completing the Certificate Wizard” screen review your settings and Click “Finish”. · Retrieve the cert file and copy it to the new ADFS server you will be adding to your farm. 2. Under “Type” choose “https” and under “SSL Certificate” choose the cert that you imported and click “OK”. · On the Welcome page, verify that Add a federation server to an existing Federation Service is selected, and then click Next. · On the Ready to Apply Settings page, review the details. If the settings appear to be correct, click Next to begin configuring AD FS with these settings. · On the Configuration Results page, review the results. When all the configuration steps are finished, click Close to exit the wizard. · Run the ADFS Configuration Wizard. · On the Welcome page, click Next. · Uncheck Use an HTTP proxy server when sending requests to this Federation Service check box, under HTTP proxy server address type the address of the proxy server, click Test Connection to verify connectivity, and then click Next. · When you are prompted, enter ‘fabrikam\svc_adfs’ and password. · On the Ready to Apply Settings page, review the details. If the settings appear to be correct, click Next to begin configuring this computer with these proxy settings. The WID database on the primary server is read/write and the WID database on the secondary server(s) are read-only. Changes made to the configuration are made only on the primary Federation Server and those changes are replicated (5 minutes interval by default) to the secondary servers via WID database synchronization. In the event that the primary Federation Server becomes unavailable and will not be brought back online, the administrator needs to promote one of the secondary Federation Servers to primary for the farm. "Windows could not start the AD FS 2.0 Windows Service service on Local Computer - Error 1053"